I find arranging them relaxing (and they take little energy - which is good since I'm pretty tired exhausted after a day on the jobsite working with my hubby...more on this topic, later). Sewing them takes mere minutes to complete. Instant gratification! Wow. Last week I left you with some more inspiration mosaics and now, another week has flown by and it's time to check in on the progress with Sew into Solids! 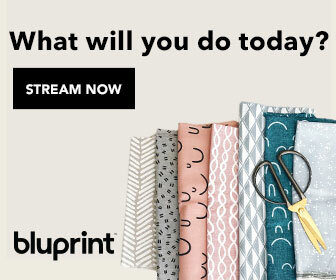 How are you doing with selecting your fabric and pattern choices? Maybe you're like me and still waiting for your fabric order to arrive... or maybe you're well ahead, like Jane, with your fabric cut and busy stitching blocks together? Do tell! 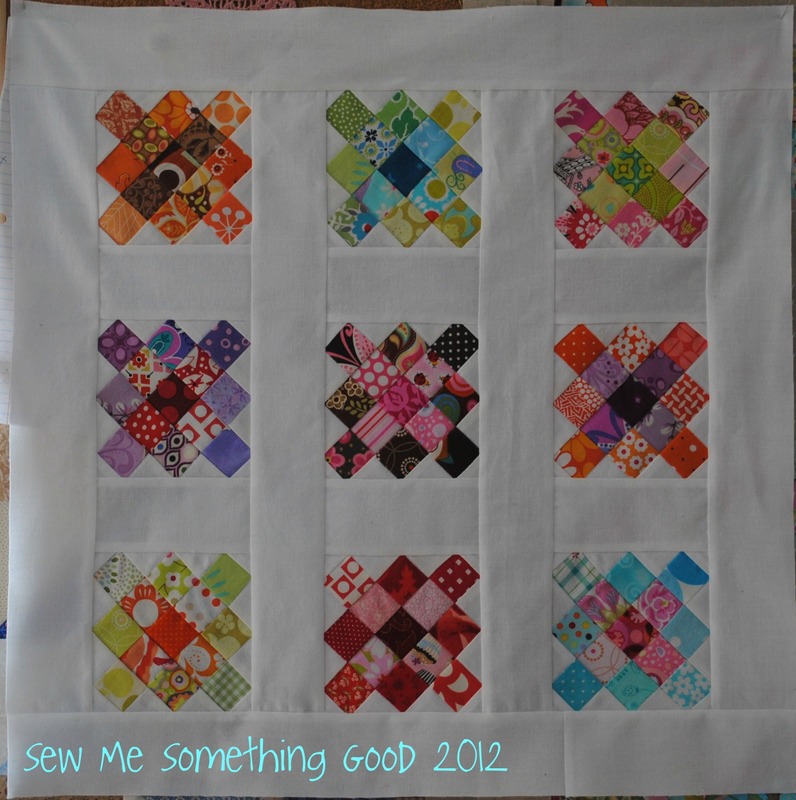 Be sure to share pics of your progress on the Sew into Solids Flickr group. We'd love to see what you're making! Last week, I showed you the stack of Kona blues that are one half of the total amount I will have to work with. I've got those fat quarters pre-washed and ready to go! I'm hopeful that the remaining selection of blues will arrive this week as I'm anxious to get cutting and stitching on that twin-sized quilt I have planned. I have to admit that while I've been waiting for my fabric to arrive I've continued to look at more possible patterns to try. I've sketched a few, I've borrowed more books from the library for ideas and I continue to look online for inspiration. 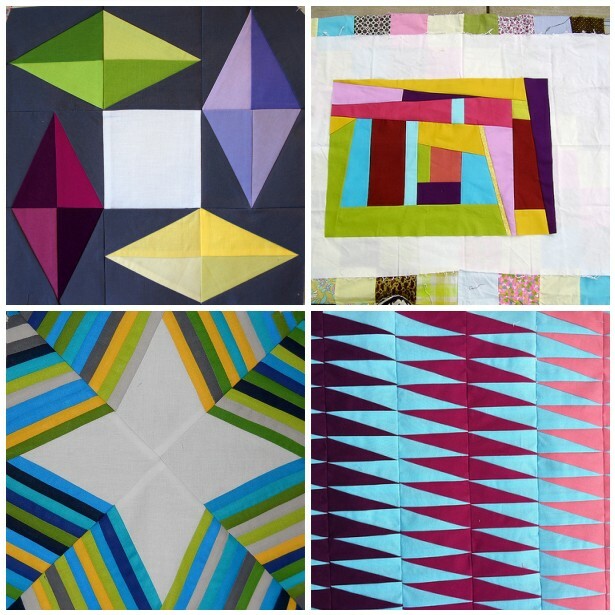 In case you're stuck for possible patterns, I'd like to recommend The Modern Quilt Workshop by Ringle and Kerr for inspiration, along with City Quilts by Cherri House and Fresh Quilting by Malka Dubrawsky. 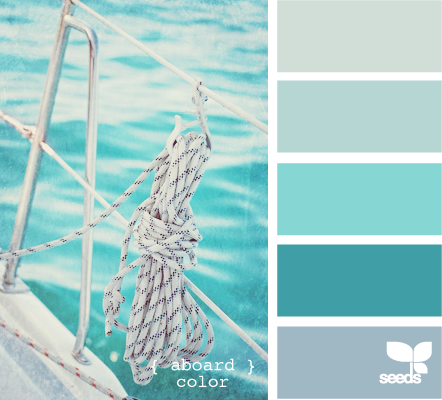 Each of these titles abound with design ideas and gorgeous palettes, in case you don't know where to start. 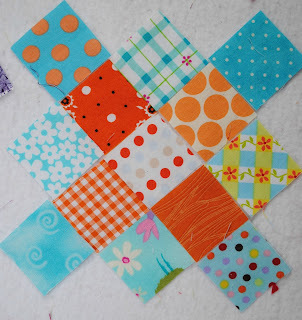 Not too surprisingly, I really couldn't wait to start sewing something with solids (while I wait for fabric for the quilt) and decided to use some colours from this fat quarter bundle I bought earlier this year for my crazy 9 patch quilt in orange. Here's what I came up with. 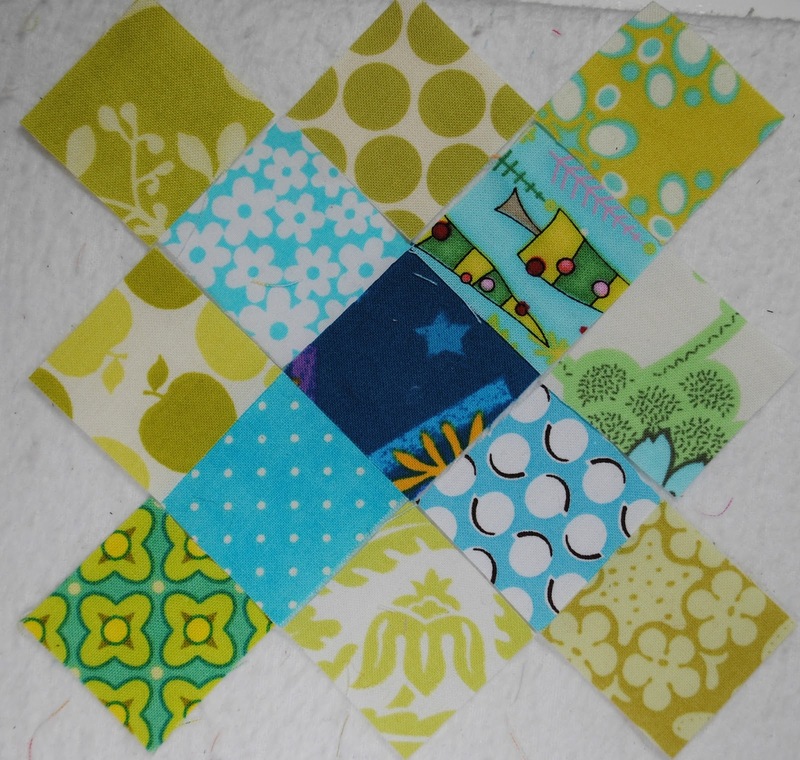 A mini granny block in 3 colours! 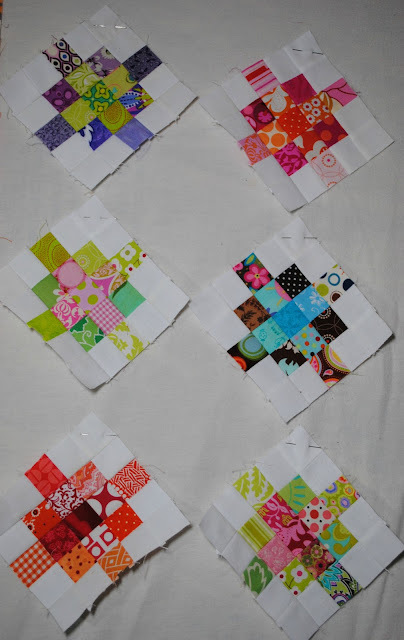 Now I'm debating over incorporating these blocks into a pillow or maybe some potholders (I desperately need new ones ;o). At least I'm getting my feet wet (metaphorically speaking) sewing something in only solids. How about you? Care to share what you've been working on? 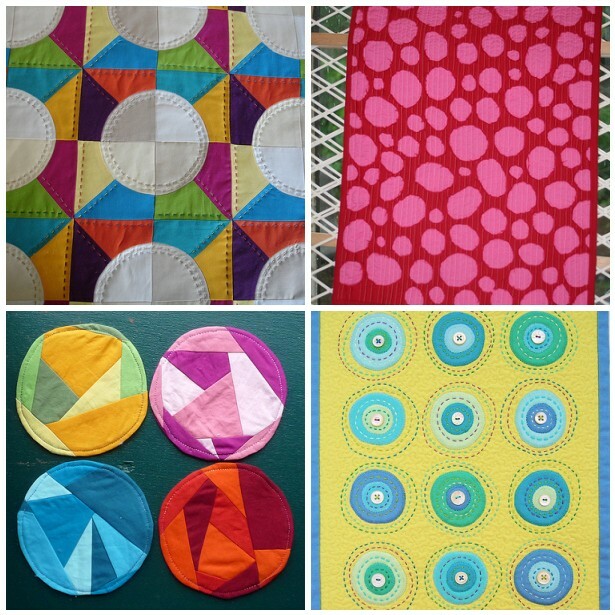 Don't be shy... go ahead and share those Sew into Solids projects on the Flickr group! If a picture is worth a thousand words... then these inspiration mosaics should get you racing to buy some gorgeous solid fabrics and start creating! The second mosaic shows how great solids work for small projects... from pillows to mini wallhangings and pot holders. What better way to dive into working with solely solids? I would say that my search has shown me the diversity that is possible. Much more than I ever thought of when I considered working with solids. 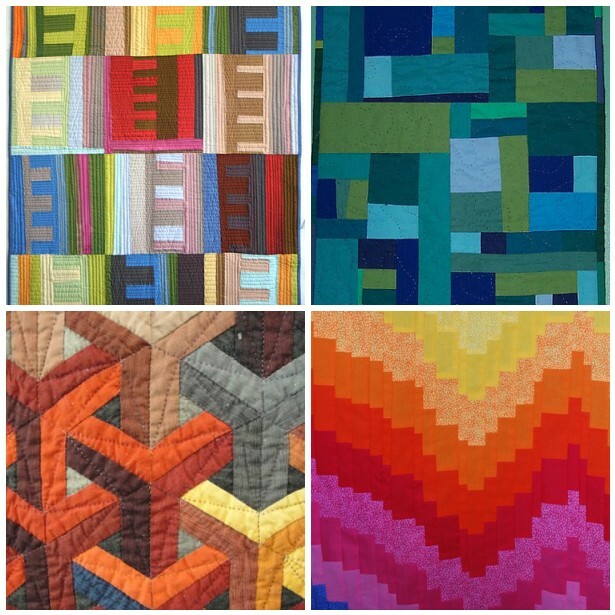 Traditional block designs look great in only solids, but solids also shine when used for modern and freestyle quilting designs. I hope I'm not overwhelming you with my mosaics. I'm looking to inspire you! Now that I've shown you what can be done... how would you like me to give you a little more help by way of a fantastic quilt along that is perfect for solids? 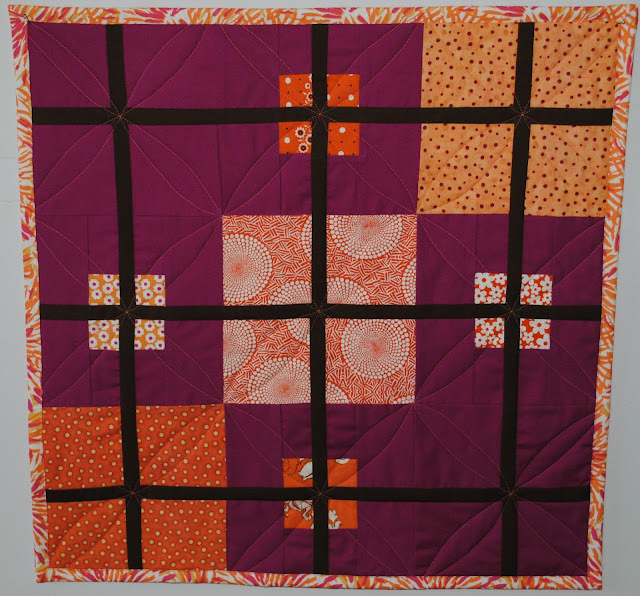 Sandi, over at Piecemeal Quilts is currently hosting the Ironwork*Quilt Along. It seems as if we planned our separate sew alongs to compliment one another! 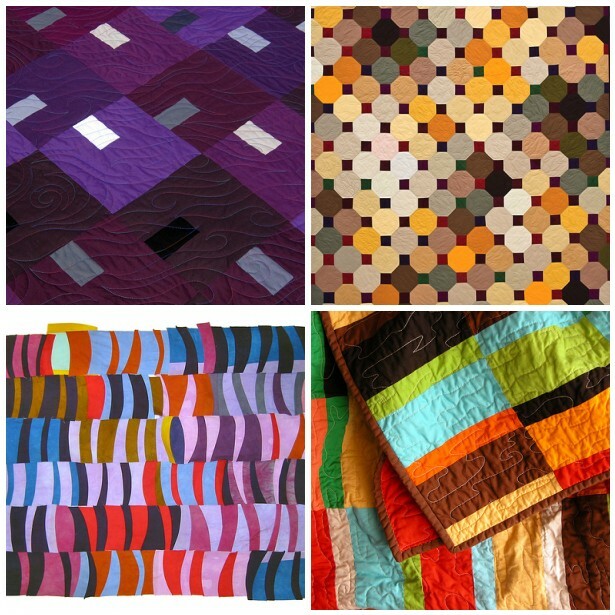 Please go see the Ironwork* Quilt Along, grab some solids and join in! I was so impressed with her detailed pattern - very user friendly. Plus, Sandi has a PDF of the cutting directions, allowing you to print out the instructions, to ensure you get the most out of your fabric when you're at your cutting table... and she even shows alternate colourways for her design (which will get your creative juices even more stirred... you may want to make one in every colourway! You have been warned....;o) Click here to see). Now I know you're feeling inspired... maybe you'll want to grab our button and join us? A big part in the adventure I'm embarking upon with our group, Sew into Solids, is in choosing colours. Every single glorious colour with all the shades and values they are made in. Reality says that this is not possible (at least not all at once, but just give me time and I wouldn't be surprised if a good many of those colours find their way into my stash...). Week 2 of Sew into Solids is about sharing what colours we have chosen for our project(s) as well as the patterns we have selected. 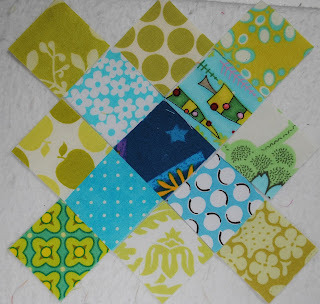 For my very first solely solids project, I'm making a twin sized quilt for my teen aged son. He wanted something more understated or calming for his quilt. That led me to deciding to stick with one colour, then liven it up by using many values. 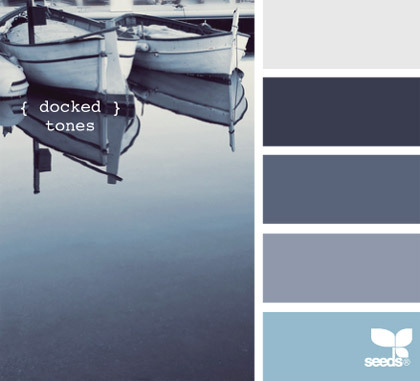 Want to see my palette inspirations from Design Seeds? along with more blues that I have ordered (which haven't arrived just yet), so I won't be cutting anything until I have the whole selection on hand. I should have about 51 blues to choose from once everything arrives. Wow. I'm really excited to be working with so many values of blue! 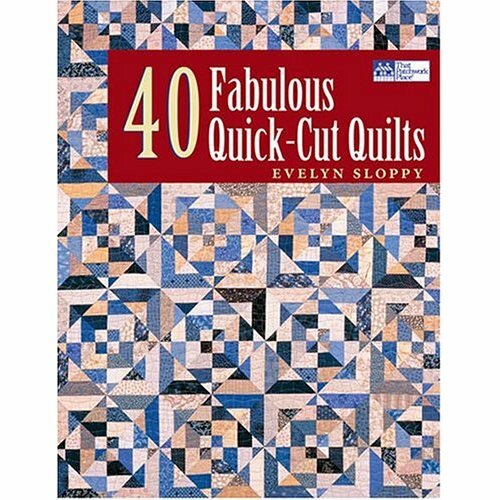 40 Fabulous Quick-Cut Quilts by Evelyn Sloppy. Click here for link on Amazon. 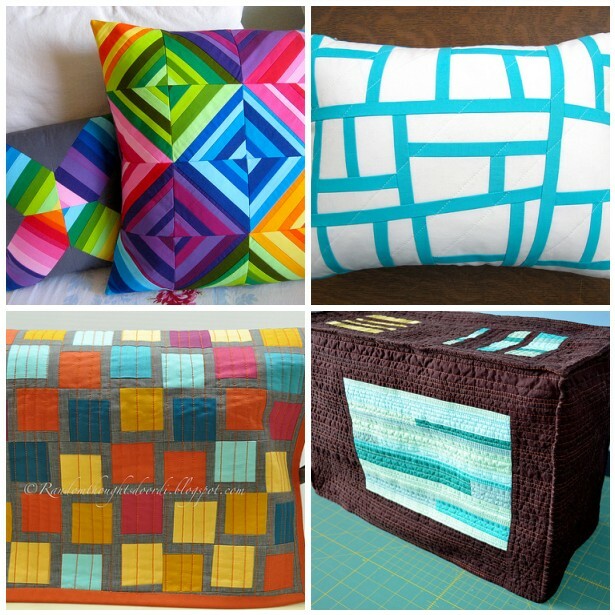 ( below and over at Sew Create It). 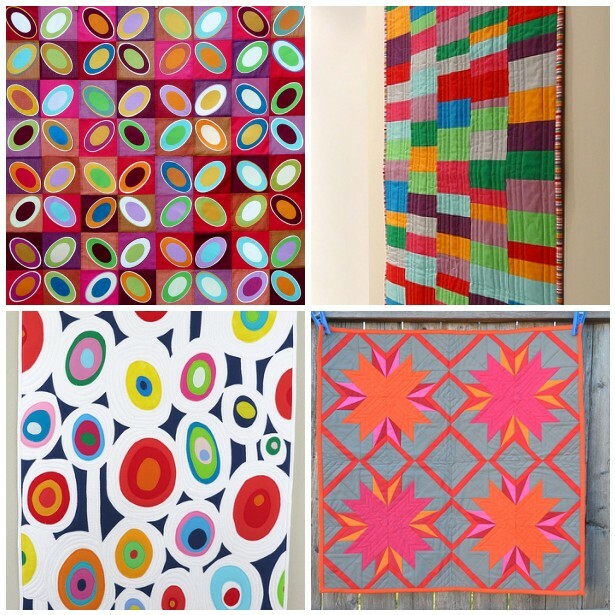 If you haven't already... please visit Jane's blog to see the gorgeous fabrics and patterns she has selected for her projects. Jane and I can't wait to see what you will be making! *Just remember to link to the actual post on your blog where you share your choices for your Sew into Solids project(s). Thanks! I think I may have a Spring fever. ;o) Not the kind that has me cleaning the house from top to bottom (although I should be doing that, too). My Spring fever is all about tackling all sorts of WIPs, thinking that the sooner I finish some of them, the better I will feel about adding new ones. My largest WIP to date, is a king size quilt for our bed. I started piecing this quilt top a year ago, then put it on hold until I found the right backing. A backing has been found, so the past couple of days I've been stitching the blocks together and adding more pieces to make the top into a king size flimsy. My living floor is just big enough for basting this monstrosity... once the furniture was removed... so now I just need to get that backing pieced! The thought of pin basting a quilt this size already has my knees dreading it, but I have never tried spray basting and am concerned about any fumes created by doing so. Any recommendations on that? How much spray would I need for a king size quilt? Is spray basting pretty fail-safe? I'd love to hear your thoughts on this. 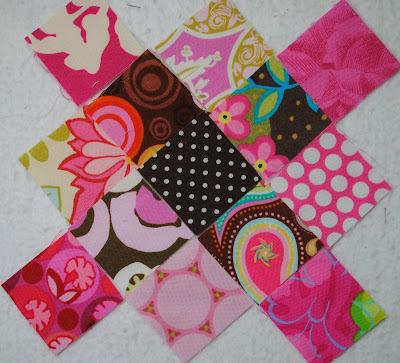 Thought I'd keep the inspiration for Sew into Solids flowing with a few links, suggestions and mosaics. I find Flickr to be an endless source for getting my creative juices stirred. For the Love of Solids Swap (check out a variety of projects sewn using only solids). 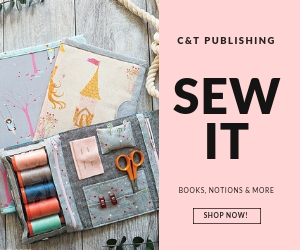 The really fun part begins with checking out these groups, then you discover that many of the individuals contributing have more projects sewn in only solids - they're only a click away! Mini quilts made solely from solids carry impact and interest. Oh, the variety! The simplest blocks look intriguing when sewn with solids. A sample of blocks in solids. The only limit is your imagination! 1. Modern Blocks - Box Kite alternate, 2. Emma's Trip Around the World, 3. spiderweb for jess, 4. Partner! Here's your mini quilt ready for quilting! Did something spark your interest? Are you seeing the possibilities you have when you choose solids? I know I am! I'm looking at solids with a fresh eye. They have taken a backseat to prints in my stash, but after browsing the images of projects created by others in solely solids, I'm rethinking my stash habits. lol I definitely want to start stitching up projects with solids. How about you? Jane and I are both excited to be sharing this adventure with you and we're here for you. We want to cheer you on as you step into the wonderful world of sewing with solids, so please join us and share what thoughts you may have on Sew into Solids (our Flickr group). We'd love to hear from you! We're gearing up to show our choices for pattern and colour starting on Monday (here and over at Jane's) and hope you're on your way to selecting a pattern and colours as well. Meantime, would you like some more inspiration to help you? This is one of my favourites. Check out those tiny ladybugs! Each square finishes at 1" - meaning I am finally using some of the tiniest hoarded scraps I have. Just proves no scrap is too small to use. ;o) oh, my! The first handful have actually been stitched together with white sashing (also from my scrap bin). P.S. 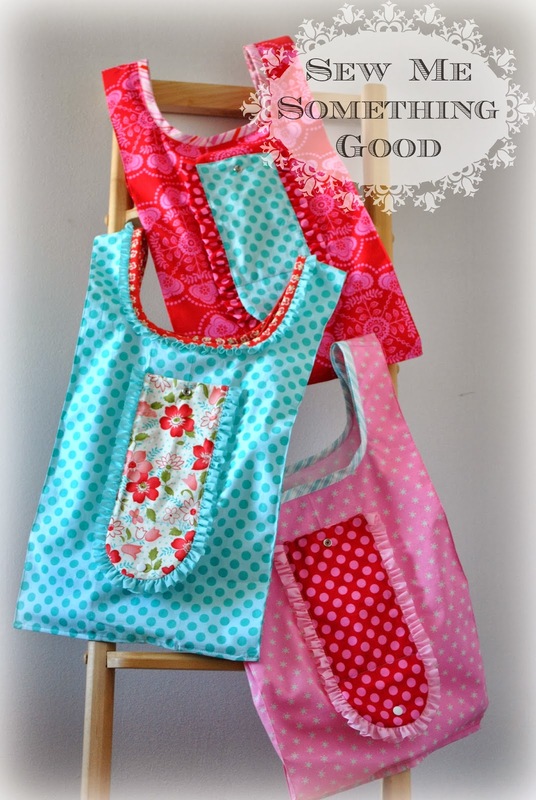 You're welcome to join Jane and I in the weeks ahead as we explore sewing with solids. 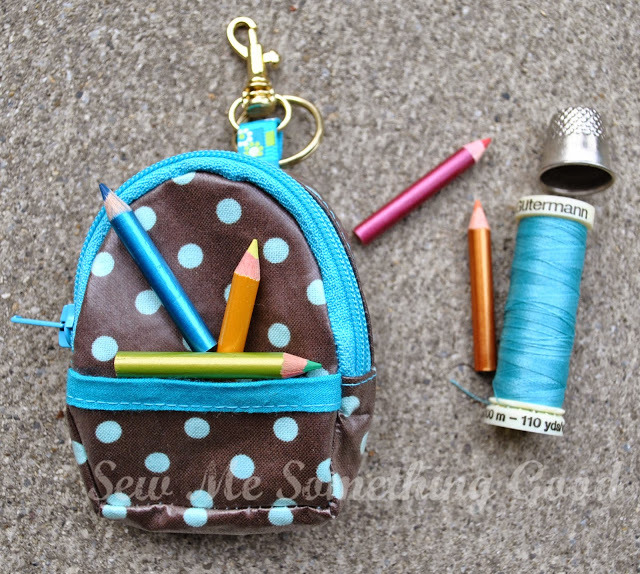 Click here and here to read more and grab a Sew into Solids button to add to your blog. 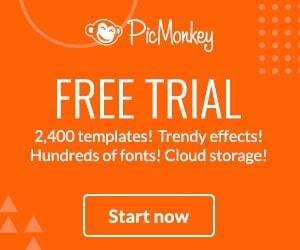 Click here to join our Flickr group. A few weeks ago, in reply to a lovely comment my friend Jane left on one of my posts, I responded with, "Thanks, Jane. I can hardly believe that it's taken me this long to get into using some kona solids. Wow. They're so lovely to work with. One of these days, I'll get really brave and make a whole quilt using nothing but solids.... ;o)"
when Jane replied, "I keep saying that too, but it hasn't happened yet..." ... an idea was born. 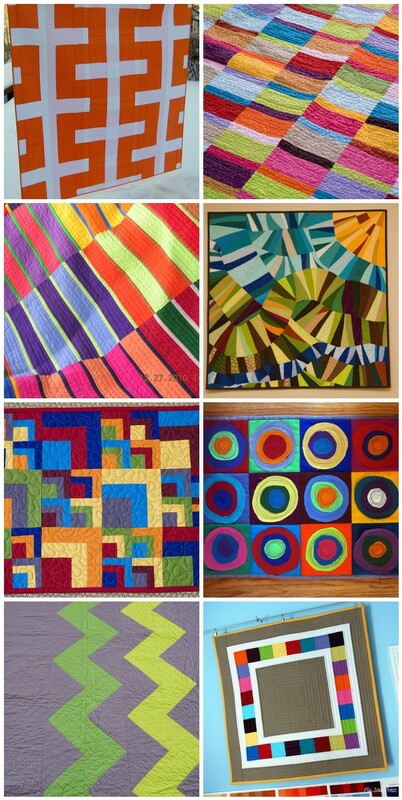 What if we teamed up to encourage and motivate one another to take the plunge and sew a quilt with only solids? What if we're not the only ones that want to work with solids but have been hesitating? Wouldn't it be fun to organize an online group as a way of inspiring and motivating ourselves and others to work with only solids? Several emails later... Jane and I have put together our ideas and are ready to share with you. We've named our group "Sew into Solids" and would love to have you join us over the next several weeks as we work our way through tackling solids - from choosing a palette, then a pattern, to sharing with each other what we make (we have a Sew into Solids Flickr group you can join and will also be hosting some link-up parties so we can see what everyone is making). 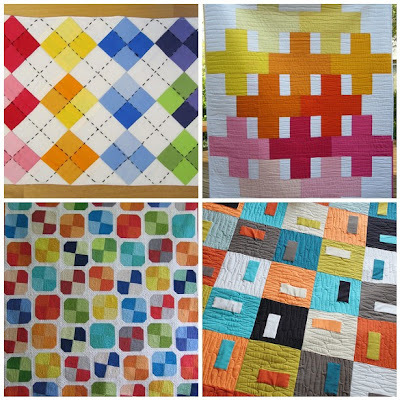 "Sew into Solids" is a group of like-minded quilters and sewists who want the challenge of sewing a quilt or project in only solid fabrics, but may not know where to start. The group is meant to inspire you and give you goals so you have continued support and inspiration whilst making your creation. Over the next 6 - 8 weeks you'll be asked to post any progress and either post pictures on flickr or join the link-up parties hosted by Jane and Katherine. Follow us at your own pace and choose to jump in as you please. We just want this to be fun! Sew let's help each other and get ready to have some fun because we're "Sew into Solids". I hope that sparks your interest and if it does, you may grab the button below and paste it on your blog and spread the word. The more of us taking part, the more fun we will have! 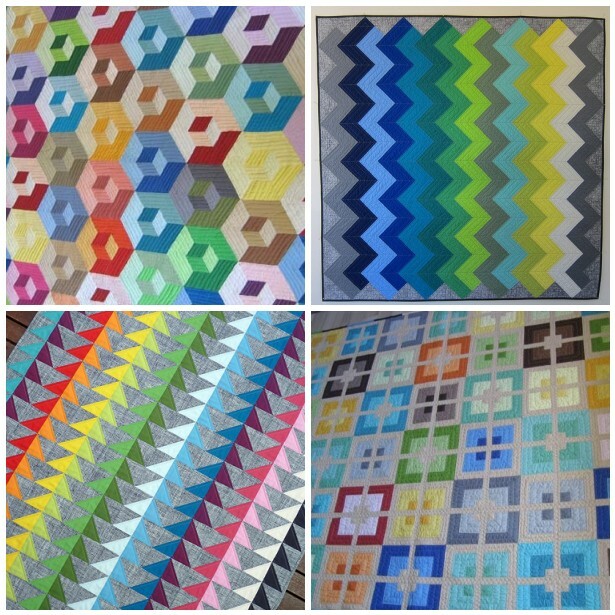 To kick things off, I thought I'd get your creative juices stirred up by showing you collections of beautiful quilts made from only solids. 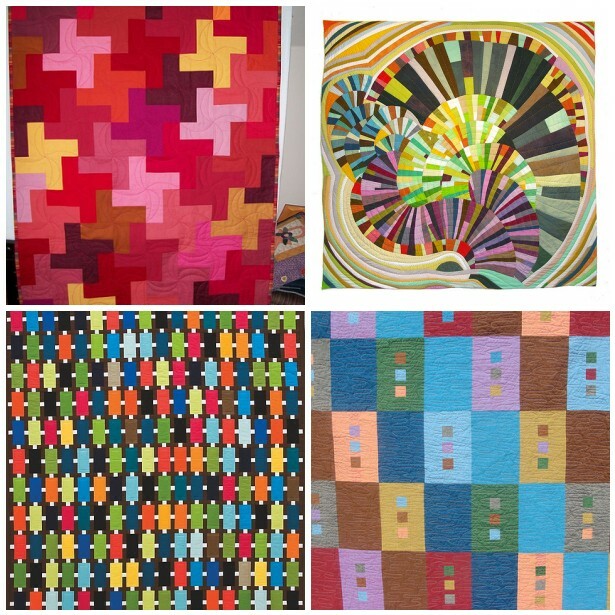 Below each mosaic you will find the links to the creators of each quilt, please click them to see more and to discover what other projects these individuals have made using solids. I can't help but be inspired when I look at the variety in design and colour. Solids are anything but boring! Of course this is but a small sampling of what's out there, but it's a start and that's what today is all about. Getting you started in thinking about the possibilities sewing with solids.... Are you feeling inspired, yet? 1. IMG_2701, 2. plain spoken quilt, 3. Bright Stripes, 4. Imperfection_1, 5. doll quilt swap quilt, 6. Kandinsky Quilt, 7. Big Zig, 8. DQS9 - Done! Now that I've got you thinking about sewing with solids... mmmm... all those gorgeous colours... I bet you would like some help in determining what colours to use. Where do you start? There's so many choices. Don't worry, help is just a click away... That's where Jane comes in! 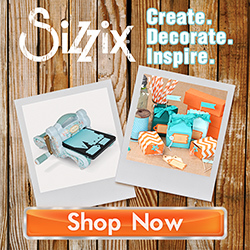 She has gathered exactly what you need to get you started and on your way in choosing colours for your solids only project(s). Before you visit Jane, don't forget to grab our button to add to your blog's sidebar and be sure to join our Flickr group. It would be great, once you join, if you'd introduce yourself there. We're hoping you'll be Sew into Solids and will join us because we look forward to having fun together! 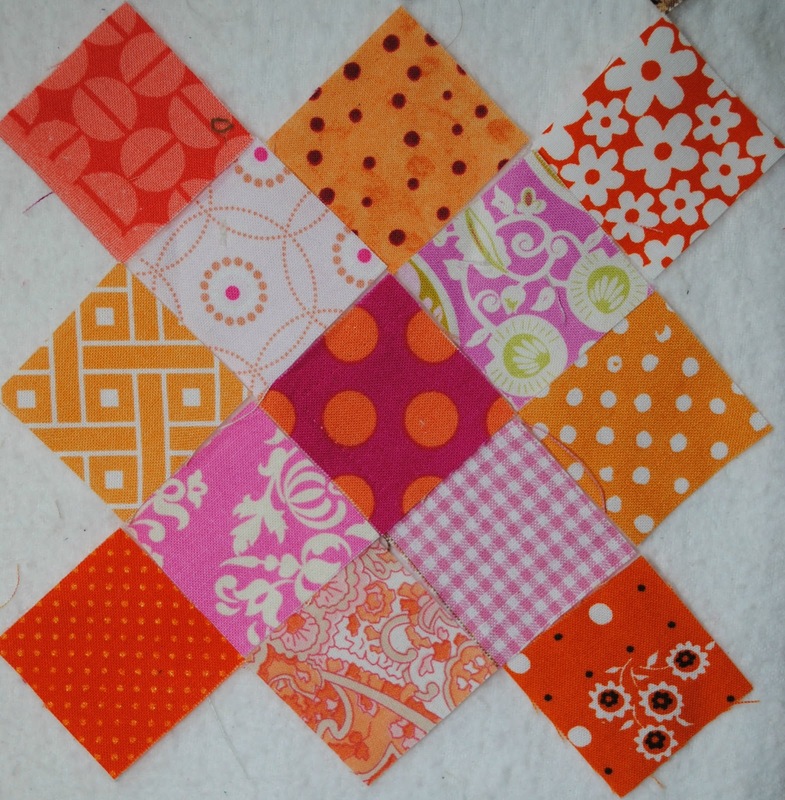 It seems I am unable to walk away from orange fabrics right now, so I've started yet another project. 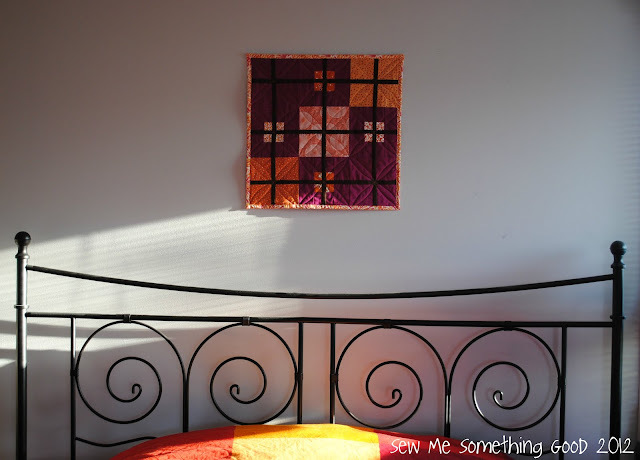 Probably comes as no surprise to find me fashioning "granny square" blocks (here's the link to the tutorial to make this block....). Resistance to this delightfully scrappy block is futile, so why fight it? ;o) So here I am puttering away with some 1.5" scraps while I take a break from pattern drafting and planning and listmaking etc. Oh, in case you haven't already heard, the finalists have been chosen for the Modern Mini Challenge and you can now vote for your favourite finalists in two separate categories (click here for the link). You will have until noon Friday, March 9th to vote and the winners will be announced that afternoon. I couldn't think of a better way to describe my new, modern mini quilt. 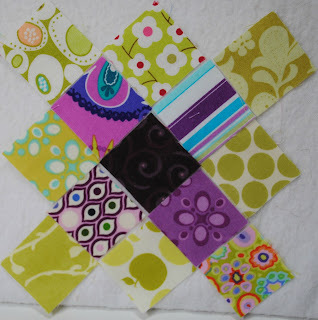 I think you understand why I used "bold" in this quilt's name... the colours are pretty much all of that (and then some! lol). It felt crazy adventurous to step out of my usual choice of a neutral background fabric and jump in with both feet and choose Kona Cerise (thanks, Pink Chalk Fabrics!). Discovering how much I liked the pairing of cerise with all those oranges was so unexpected as was the inspiration behind my design. I was flipping through a knitting book when a pattern for an argyle sweater caught my eye. Immediately, I could envision a quilt block version (if you turn my quilt on point, you may see the argyle influence). 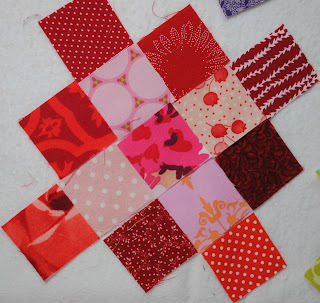 The idea for the lovely colour pairing in my quilt came from a little scrap of fabric. See that sweet flower print on the left, down in front? That little beauty got me thinking. From there it was simply a matter of grabbing the rotary cutter and being bold! 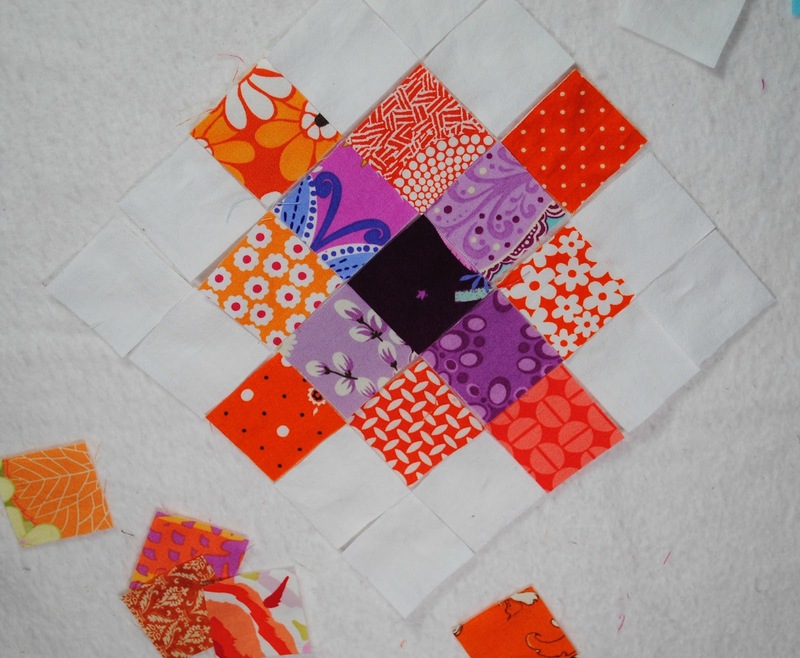 Yet again, this mini was mostly fashioned from leftover fabrics from other projects, including my Orange Twirl quilt (which sadly, could not be finished in time for entering the Tangerine Tango Challenge). The strips of Kona chocolate were scraps from the crazy 9 patch blocks I have ready for the quilt for my hubby. I used nearly every last inch of that luscious chocolate fabric and I was concerned that I wouldn't have enough, it was that close! The next bit of unexpected delight came about when I placed a recent order for some orange fabrics to finish Orange Twirl. One of the fabrics I'd chosen was out of stock and was replaced by Dear Stella in Mumsy. Hello, orange and cerise! This fabric was the obvious choice for binding my new mini quilt. The colours were perfect! Looking at the bold graphic lines in this design had me initially thinking I should quilt straight lines, but somehow it didn't seem right. At the last moment I realized I could use the lines in the piecing as a guide for some diagonal chalk lines and from there, I could add in some gentle curved stitching. Boy, am I glad I decided to forgo straight lines and use curves instead! 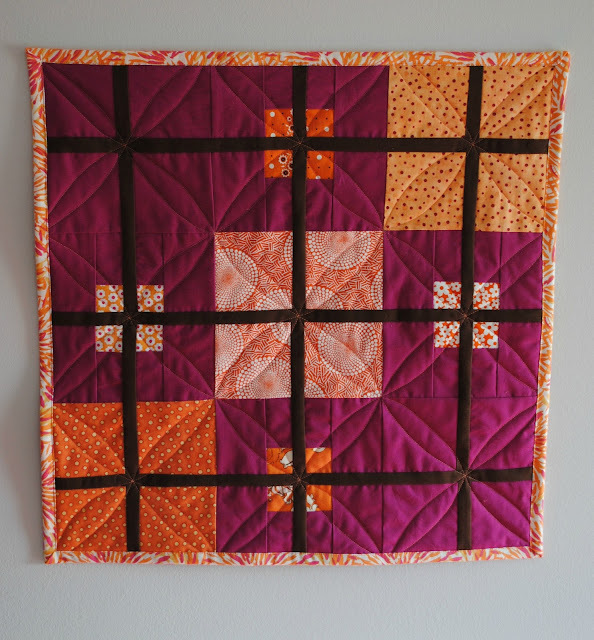 The quilting adds a secondary pattern along with some texture to the stark, bold lines of the quilt design. I really like the contrast. Being bold, I even quilted using Aurufil's 50wt quilting cotton in orange. How fun! 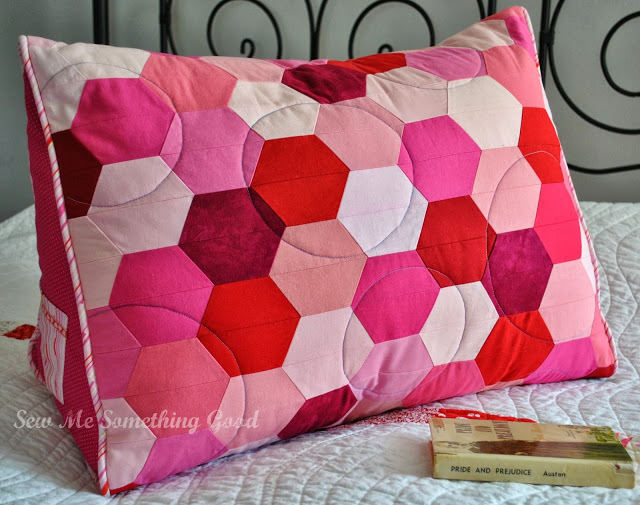 Today, I entered my One Heart Reading Pillow over at the Quilting Gallery for this week's theme, Quilted Pillows. You can check out all the great entries and then vote for your favourites. Be prepared to be inspired when you visit and if you have a moment, please place your votes between Friday, March 2nd - Sunday March 4th. Thanks to Michele for hosting these weekly themed contests! This is my first time participating and wouldn't you know it... I managed to upload my pillow photo sideways for the contest... which of course I didn't realize, which I guess should make my entry standout. ;o) Ooops.